Greenwich is within reasonable proximity of five active airports that among them serve the major airlines covering the globe and the domestic U.S. market. All are linked to various forms of ground transportation and offer parking hourly, metered, short-term parking and long-term. LaGuardia Airport: From downtown Greenwich, LaGuardia is 28 miles away and between 44 and an hour and 15 minutes by car, depending on traffic. LaGuardia is served by 25 airlines and 400,000 flights in and out a year, largely domestic. 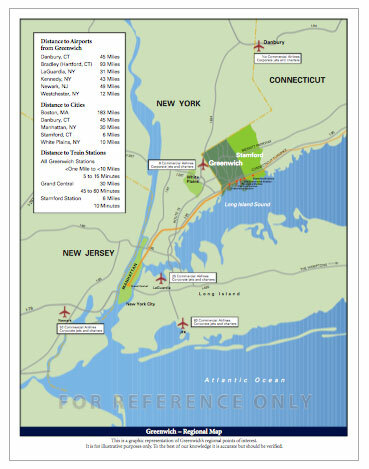 John F. Kennedy International Airport: JFK is 44 miles away and from 51 minutes to an hour and 25 minutes by car. JFK is America's leading international gateway. Newark International Airport: Newark, 47 miles from downtown Greenwich, is an hour and 15 minutes to an hour and 45 minutes by car. Bradley International Airport: Farthest away but without the frenetic pace of larger airports is Bradley, 95 miles, about 12 miles north of Hartford, CT and up to two hours or more by car. Westchester County Airport: Westchester offers the convenience of being minutes away by car, off King Street (Route 1230A, north of the Merritt Parkway), just across the New York state border and less than five miles from downtown Greenwich. The airport is also the base of one of the largest fleets of U.S. corporate jets.